An irregular and rather-late flowering during the second half of cold and rainy June, resulted in a hot berries around many of the parcels. But the very beautiful weather condition during the month of July, with record sunshine and temperatures, hinted at a great quantity and quality potential for the 1995 Alsace harvest. Unfortunately for the 3rd consecutive year, these wonderful harvest promises were partially thwarted by abnormally rainy weather during the month of September which, considering the already advanced ripeness, pushed everyone to set the official harvest dates earlier than planned. For the first grapes picked, the wine-makers had to juggle with the capricious weather as well as preserve the quality by undertaking very meticulous sorting of the spoiled bunches in numerous parcels. However the grapes picked in the first ten days of October benefited from splendid weather allowing them to be bursting with sugar while maintaining harmonious acidity. In general it was an inconsistent harvest both from the quality and the quantity standpoint, and often heterogeneous, which was very disparate between the northern and southern parts of Alsace. 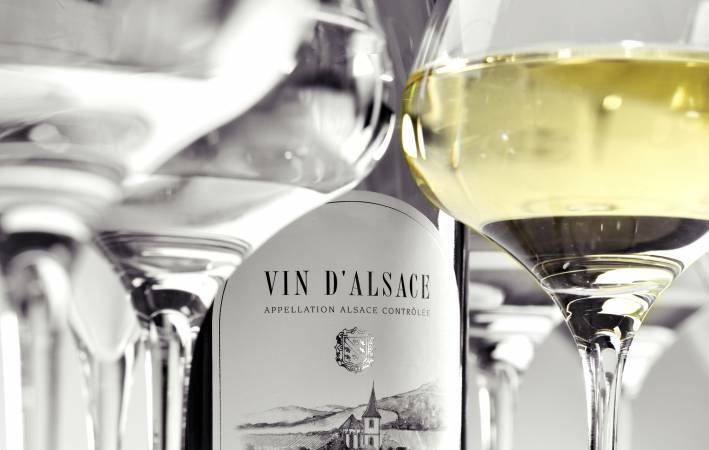 Alsace wine-growers were initially convinced that this harvest would be larger than the average in terms of quantity, but in fact they ended-up with a wine volume of 1,089,000 hl, making a significantly lower lever than the average. The harvest began for AOC Crémant d'Alsace on September 21 (Auxerrois and Chardonnay grape varieties) and September 25 (Pinot Blanc, Noir and Gris as well as Riesling grape varieties). They continued as of October 5 with the harvesting of AOC Alsace and Alsace Grand Cru grapes. The most successful wines reported in 1995 were the Riesling, boasting exceptional maturity, and in the Pinot, notably the Tokay Pinot Gris with a promising richness. A beautiful volume of Vendanges Tardives and Sélections de Grains Nobles also came to complete the best cuvées of this vintage year. A beautiful surprise for this cuvée disgorged after a year of ageing on lees, which evolved wonderfully. Age has given it a yellow hue, fine bubbles and a nose of dried fruits and biscuits with a palate holding good density and a compact foam. This wine has retained a lot of freshness and has wonderfully evolved. A wine which reveals the regional know-how in producing fantastic sparkling wines with keeping potential. (Last tasted in May, 2009). Very assorted vintage year with variable evolution, strong resembling the 2011 vintage year. The difference in ripeness, the health conditions during harvest time all significantly influenced the wine balance which has extremely varied levels of maturity and rot. In years like this, the Crémant d’Alsace always remains a solid value due to the early harvesting quality.